Everybody needs a little time away. Escape daily routines and outer demands, and encounter the joy of Ashtanga Yoga, Meditation and Self-discovery in nature’s perfect setting: Swedish Lapland. Here, in the Land of the Midnight Sun, you will find the ultimate combination of relaxation and adventure, letting you deepen your knowledge and enhance your connection to practice. Encounter wilderness and possibly the purest air you’ll ever breathe; indulge in plenty of the things that are in scarce supply elsewhere: time, space, tranquillity, silence, clean water and bright, magical midsummer nights. This 7 day retreat offers Ashtanga Yoga classes for all levels (beginners, intermediate and advanced), under the guidance of Petri Räisänen. Petri will be accompanied in the shala with Wambui Njuguna and Aksana Kurola. Passionate about yogic food, Fredrik Gabrielsson will be the retreat chef, specializing in super delicious Western, Indian and Thai food! All recipes are vegetarian or vegan with plenty of raw food options. Melderstein Herrgård is situated at the beautiful river valley of Råneå river, about 12 kilometers North-West of Råneå, in the far North of Sweden. Råneå river is Sweden’s largest woodland river and one of the few rivers that has not been exploited for hydroelectric power. The manor house was founded in 1740, and is still owned and run by the same family. It has an interesting history, which you can read more about on www.meldersteinherrgard.se. Here you can have the perfect combination of relaxation and adventure. The surroundings are very calm and quiet, and the unspoiled nature is always present. You decide how to spend your days… on beautiful and gentle nature walks or energising hikes; challenging yourself with the thrill of river rafting; quietly laying down with that book you have been waiting to read; taking part in the classes offered; experiencing a hot and cleansing sauna; or simply sitting and taking in the views. All activities are optional so you can do as little or as much as you like, taking time out to reflect and relax. 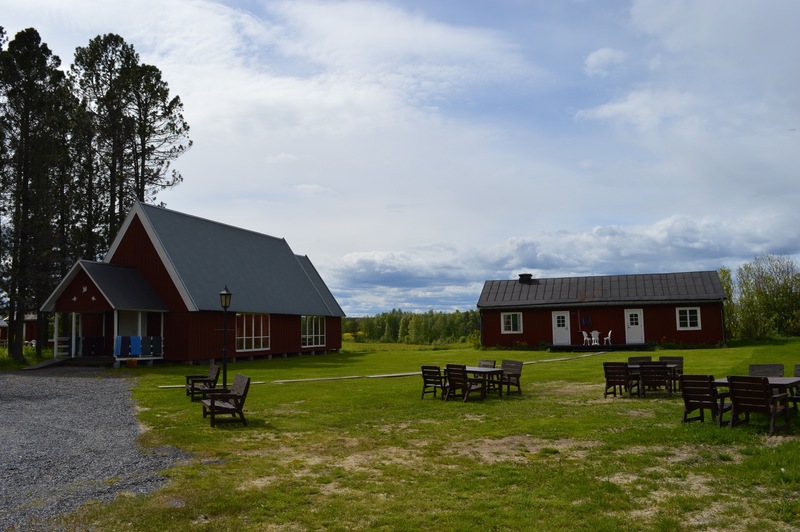 There are 28 beds available, in 11 spacious shared bedrooms, all of them (except Bagarstugan, small cabin and single rooms) having their own toilet and shower. Half of them (comfortable) are in the main building (mansion), and the other half (standard) are in Annex, big cottage (Bagarstugan) and small cabin (Habre). Check out accommodation here. The main building (built in 1740) has two bigger twin bed rooms (R2 and R3), five normal size twin bed rooms (R4-8), two single rooms (R1 and R9) and one conference room (R10) with four beds. Single rooms has toilet en suite, and the shower can be found just across the corridor or at the sauna. Twin bed means two separate beds, but they can be moved together. The mansion has a 18th century decoration and very beautiful rooms with nature views. These three houses are built in the 20th century. They follow the local Swedish country side architecture. Wooden house with red natural hand made paint. Annex has left and right side. Both sides has three rooms. Five of them (R11-16) are twin bed rooms and R17 is a double bed room, which fits well for the couples. Bagarstugan has two twin bed rooms with toilet and shower. Hare (Cabin) has one room with twin beds. Shower and toilet are at the sand building about 30 meters walk away. There is plenty of space for tents (please bring your own!) on the grass field next to the yoga shala and main buildings. The summers in the North are usually warm and pleasant, but there is also possibility of rain and colder days, with night temperature dropping anywhere between 5-15 C. In case of heavy rain we are ready to offer the yoga shala or mansion’s upstairs room as accommodation for those nights. The shala should be empty for the early morning practice. The bathroom and shower facilities are available at the sauna building. The prices above are per person and include yoga, accommodation in shared bedrooms (except single rooms) and meals, as well as all the classes in our daily schedule (meditation, pranayama, discussion groups, technique classes), sauna and more. People staying for the full period have priority, but if there is space left you may also choose to come for only a portion of the retreat. It’s possible to take part only in the morning practice (check Drop-In option below). Due the limited number of rooms, we can only accommodate those who are participating in the yoga retreat. We can, however, provide space for a yogi couple and a child in the same room (extra beds available for the Comfortable rooms). Please let us know if you are coming with a child and we will check the extra bed price. Comfortable single rooms are the only ones available for a single stay. 1) two 2 person rooms with 2 beds each; shared bathroom and WC. 2) 4 person room, 4 beds. 3) 2 person room, 2 beds. Shower and toilet in sauna which is next door. Yoga VAT (Finnish tax office) is included in all of the prices above. With accommodation VAT is paid through Swedish tax office. Trips: Day trips and other activities are optional and will be charged separately. Please check the prices from our schedule. You are welcome to join us for morning Mysore classes and/or the full-day program. Recommended starting time is 7:00-7:30am. The cost for morning Mysore is 300 kronor (Swedish Kronor) and full-day program is 400 kronor. Drop-in classes can be paid through bank transfer to Petri’s account or in cash in Melderstein before or after your classes. If you take part of many classes and paying in cash, please pay after your last class. Single meals are available. With the breakfast talk with Gunnar or Goran at Melderstein Herrgård and with lunch/dinner Petri or Wambui. 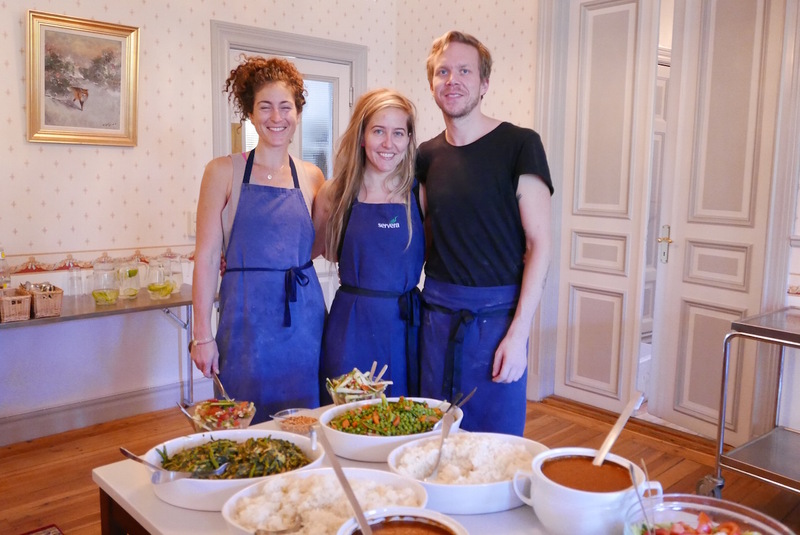 The retreat will also provide you all the nourishment your body needs: three delicious vegetarian meals and a afternoon snack every day will nourish and help cleanse your body. 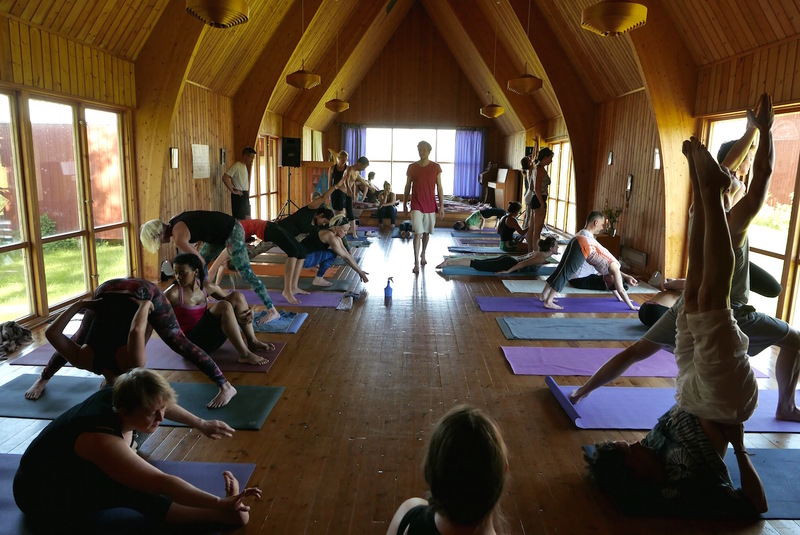 The shala, our space for yoga, is a beautiful and spacious chapel with lovely wooden floor. Unique midsummer light gently pours in through generous windows, creating the perfect atmosphere for both focused yoga practice and relaxation. Having the purest air in Europe, we believe this retreat will give you a renewed sense of wellbeing and inspiration for your own yoga journey. Traveling here is nice and comfortable. Melderstein is well connected: the airport of Luleå/Kallax is about 45 kilometers away, Luleå train station about the same. Buses go frequently from Luleå to Råneå. From Råneå it’s less than 10 minutes by car (about 10 kilometers) to Melderstein. If you arrive to Råneå with bus, usually there will be someone picking you up. There is also taxi in Råneå (+46 924 100 00), to make sure you will get to Melderstein (+46 924 510 37 or +46 920 25 70 17). Råneå is about 90 kilometers from Tornio (Torneå) and about 120 kilometers from Kemi airport (Finland) and train station. Buses go from Torneå/Haparanda bus station to Råneå. For more information, please refer to the Getting here page. The sea is only 15 minutes away by car, and there are several seaside resorts to go visit and plenty of boat-trips from Luleå, if you would like to spend a day in the archipelago. Several easily reached nature reserves can be found in the area, with rich animal and bird life as well as unusual and impressive sights like for example traces of the ancient inland ice (still visible!). The stream that runs next to the mansion is very good for canoeing and there is plenty of excellent sightseeing to do in area. Storforsen is one of our personal favorite attractions. Situated not far from Älvsbyn, Storforsen boasts massive rapids amongst fantastic, smooth rocks. It’s the largest free-flowing rapids in Scandinavia, a truly breathtaking view, with a drop of over 82 meters. During the spring flood around Midsummer the volume of water can reach 870 m3 per second! Another must-see is the world heritage site Gammelstads kyrkstad (Gammelstad church town), a unique site found on UNESCO’s World Heritage List. However, don’t worry about finding yourself totally lost in the wilderness, without any connection with the “real” world. Less than 30 minutes away by car, central Luleå offers a large selection of shops, restaurants as well as a vibrant cultural and entertainment scene. Read more about stunning sights, thrilling adventures, pristine wilderness (and even a couple of secrets!) on our page about Swedish Lapland.